Harvard Yard, in Cambridge, Massachusetts, is a grassy area of 22.4 acres (9.1 ha) enclosed by fences with twenty-seven gates. 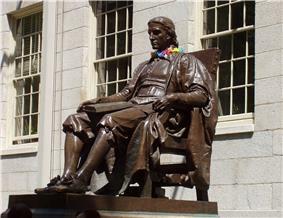 It is the oldest part of the Harvard University campus, its historic center, and its modern crossroads. 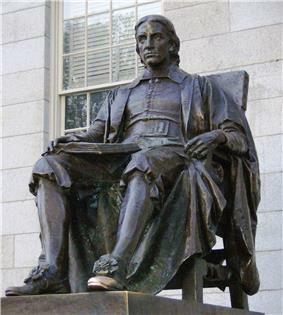 Bounded principally by Massachusetts Avenue, Cambridge Street, Broadway, and Quincy Street, it contains most of the freshman dormitories; Harvard's most important libraries; Memorial Church; several classroom and departmental buildings; and the offices of the Dean of the Faculty of Arts and Sciences, the Dean of Harvard College, and President of Harvard University. Harvard Square is adjacent. The center of the Yard—a wide grassy area bounded by Widener Library, Memorial Church, University Hall, and Sever Hall known as Tercentenary Theatre—​is the site of annual commencement exercises and other convocations. The western third of Harvard Yard, which opens onto Peabody Street (often mistaken for nearby Massachusetts Avenue) at Johnston Gate, is known as the Old Yard, and around it cluster most of the freshman dormitories. Among these is Massachusetts Hall, which, having been constructed in 1720, is the oldest still-standing building on Harvard's campus and one of the two oldest academic buildings in the United States. The lower floors of Massachusetts Hall house the offices of the President of Harvard University. The original Harvard Hall on this site housed the College library, including the books donated by John Harvard—​all but one of which were destroyed when the building burned in 1764. 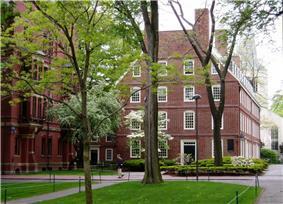 Rebuilt in 1766, Harvard Hall now houses classrooms. ^ Hammond, Mason (Fall 1983). 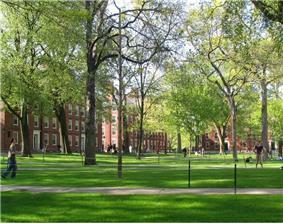 "The Enclosure Of The Harvard Yard.". Harvard Library Bulletin xxxi (4). pp. 340–383. ^ Massachusetts Hall and the Wren Building at the College of William and Mary are both often described as the oldest; however, the Wren Building was originally built before Massachusetts Hall. Nestled among Mower, Hollis, Lionel, and Stoughton Halls is Holden Chapel, home of the Holden Choirs. Nearby is Phillips Brooks House, dedicated to student service to the community. Wadsworth House houses the Office for Scholarly Communication, the Harvard University Librarian, the Office of the University Marshal, the Office of Commencement, and those of several professors. Loeb House is the home of Harvard's governing bodies: the Harvard Corporation and the Board of Overseers. The freshman dormitories of Harvard Yard include the upper levels of Massachusetts Hall, and Wigglesworth Hall, Weld Hall, Grays Hall, Matthews Hall, Straus Hall, Mower Hall, Hollis Hall, Stoughton Hall, Lionel Hall, Holworthy Hall, Canaday Hall, and Thayer Hall. Libraries in the Yard are Widener Library, its connected Pusey Library annex, Houghton Library for rare books and manuscripts, and Lamont Library, the main undergraduate library. Classroom and departmental buildings include Emerson Hall, Sever Hall, Robinson Hall, and Boylston Hall. The Harvard Bixi, a Chinese stele with inscribed text, is located near Widener.